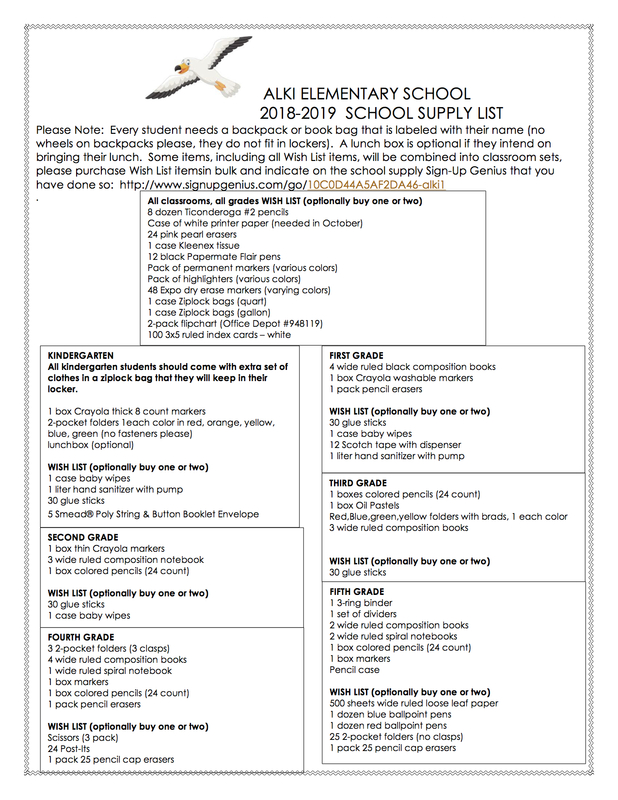 The Alki school supply list is here! Both individual student supplies and wish list/bulk classroom supplies are listed. Send your school supplies (and any items purchased in bulk) with your student on the first day of school. What are bulk supplies? School supplies are a lot cheaper when purchased in bulk. Instead of everyone buying a small amount of each item, let’s each pick an item or two and buy a large amount. Sign up here. Thank you to the Alki Staff and Parent Jennifer Ogle for compiling this list. To print the Alki Elementary School Supply list, Click here. CLICK HERE to sign up for Bulk Supplies! August 21, 2018 in Around the School.